We reached an important milestone at Steps last night with the completion of our first ever speech and language training course for teachers. Our Speech and Language Therapist Hayley Thomas has been leading the course for the last 10 weeks. It ended on a high with all learners designing a poster to showcase their new-found knowledge. 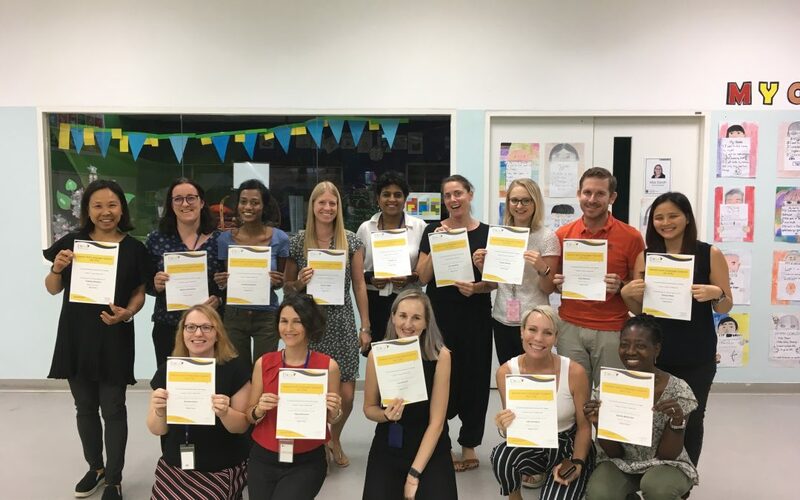 This is the first group of teachers in Bangkok to train on the UK-accredited Elklan Speech and Language Support for 5-11s, and Hayley is currently the only qualified trainer in Bangkok. The course brought together 14 classroom teachers and learning support staff from NIST, Bangkok Prep, St Andrews 71, St Andrews 107, Early Learning Centre, Shrewsbury City Campus, Traill International and ISB. Delegates worked through weekly tasks focusing on specific areas of speech, language and communication to deepen their understanding of speech and language needs in the classroom. Thanks to all the delegates for taking this important step towards making their classrooms more inclusive. If you’re interested in signing up for our next round of Elklan training, you can find out more on our training for schools page.